Acne is the most common skin condition in the United States. Everyone has had a blemish at some point or another – and usually at the most inopportune time. More severe forms of acne can have a lasting impact on a person’s confidence and self-esteem. 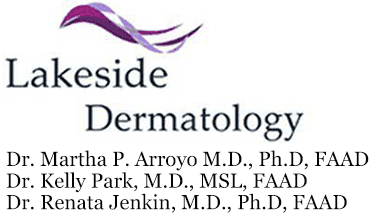 At Lakeside Dermatology offices in Gurnee and Libertyville, Illinois, Martha Arroyo, MD, PhD, FAAD treats the causes, symptoms, and scars from acne, giving patients the beautiful skin they’ve always wanted. Call to schedule your appointment today. Acne is often spurred by hormonal changes that happen during the teen years, but it can show up at any point in life. Babies all the way up middle-aged men and women get acne. Dead skin cells usually rise to the surface of our pores and are shed. Acne develops when those dead cells become trapped in pores, causing blackheads, whiteheads, and pimples. If bacteria is left to multiply inside pores, cysts, and nodules develop. Acne usually appears wherever oil glands are located: the face, shoulders, back, upper arms, and chest. Some conditions aggravate or trigger acne outbreaks. Soiled or wet clothing like hats and athletic uniforms can cause acne. Touching or picking at oily areas of the skin also leads to breakouts. Acne also comes on with hormonal changes like puberty and menstruation. Dr. Arroyo understands that acne can profoundly impact how you feel about yourself. She offers a wide variety of treatment options to improve the itching and redness of acne lesions. At Lakeside Dermatology, every patient receives a custom treatment plan designed for the type and severity of their acne. Treatment options depend on your age, skin type, and lifestyle. It’s important to note that over-the-counter creams and lotions are rarely effective in treating more than the occasional blemish. Use oil-free, non-comedogenic beauty products that won’t clog pores. Wash the affected areas twice a day and after sweating. Use only your fingertips to wash your skin; anything else is too abrasive. Resist touching, picking, or scratching your acne lesions. Avoid sunlight and tanning beds, especially while using certain medications. With a bit of TLC at home and expert treatment at Lakeside Dermatology, your acne will be a thing of the past. To begin your journey toward bright, glowing skin, call or book your appointment online today.